Conner, Mike. Archangel . Tor 1995. What if: German use of biological warfare in World War I got out of control, resulting in a devastating plague of hemorrhagic fever afflicting only non-black humans. Summary: In 1930, a newspaper photographer in "Milltown", MN, tracks down a vampire-like killer while a third wave of "Hun" afflicts the city. His attention is quickly drawn to a local plague research site. 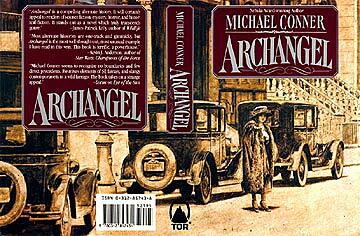 Comments: Author's name incorrectly shown as "Michael" on cover of 1995 edition. Published: Tor 1995 (0312857438BUY), 1996 (0812543211BUY).